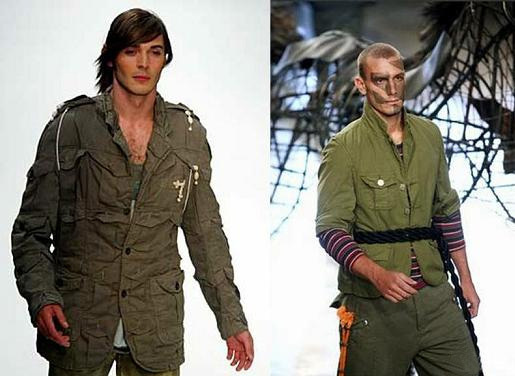 The men’s military fashion trend is not something right out of the rack. The flamboyant style has popularized right from the time it has been introduced starting from the 1980s to the time it was revived in 2008/09. But we can see that the 1980s fashion revival is losing the charm. This decade had called for a new swatch with a high end focus on subtly and quality. The military trend that would evolve in 2010 is expected to be more articulate. Latest fashion trends suggest that the military fashion has found a stalwart position in the wardrobes of all fashion chasers. There are two key pieces that you need to consider if you wish to try on the military trend this fall. Number one, a greatcoat. The color combos that are strongly recommended are Army green and Navy / Air Force navy hues. You can pick single or double breasted suits but never forget to detail with brass buttons. To get the authentic look, grab some antique buttons or purchase a vintage piece and simply pull out a needle and thread. Make sure that the cut has been altered accordingly. You can leave the coat belted or unbelted. Number two is almost mandatory; aviator boots with shearling. But make sure you are just being on trend not like attending a fancy dress party.